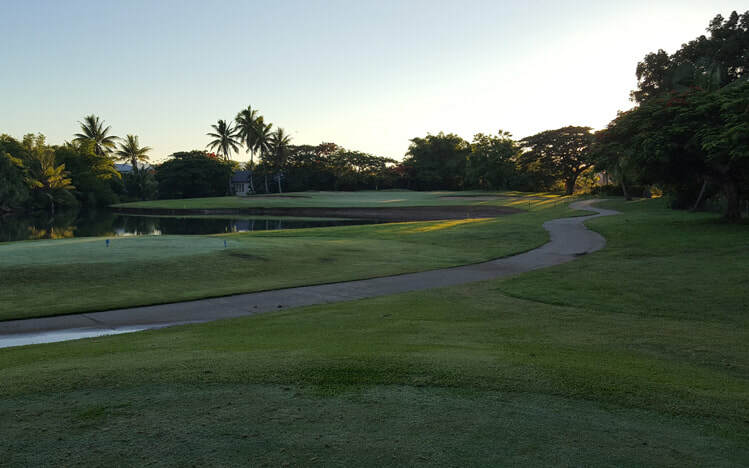 Denarau Golf Club Hole 2: This short par four has no trouble off the tee. The second shot has to avoid a pond that is short and left of the green. The putting surface tends to "lean" towards the water on most putts. 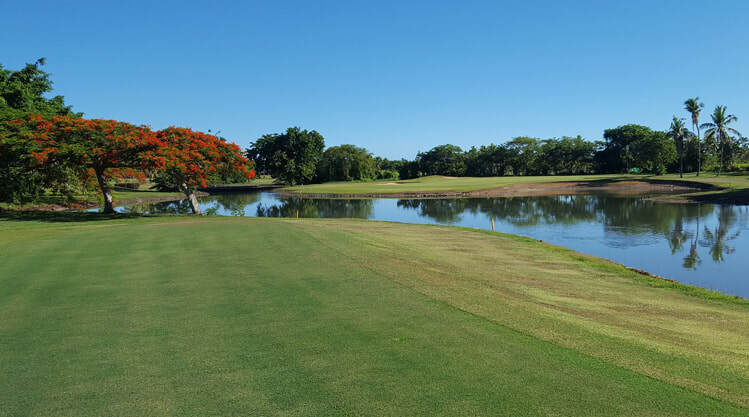 Denarau Golf Club Hole 3: Another pond greets the player on the par 3 third. It is fairly short of the green with only front pin placements being mildly troubled by it. The sand left and right is the more real hazard to avoid. 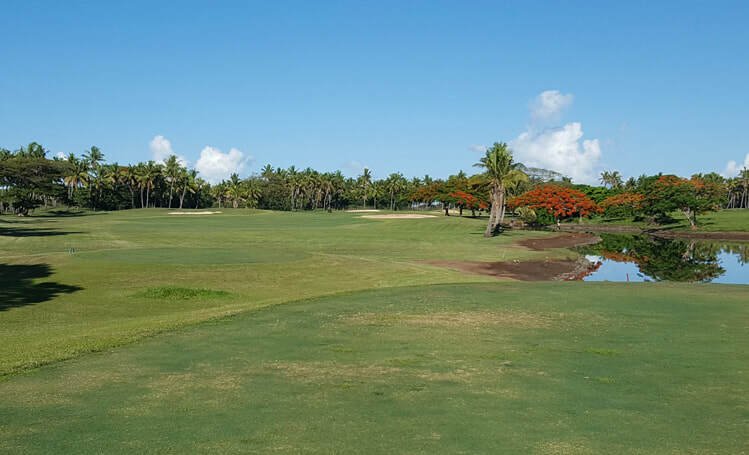 Denarau Golf Club Hole 6: This dogleg right (slight) par four requires a strong drive between the trees and one that needs to avoid the large bunker on the left side of the fairway. There is OB way left so the player can't get too crazy with the control. The green is fairly wide open and relatively flat to putt. Denarau Golf Club Hole 8: This par four may have the one truly diabolical hazard on the course and it is the one that cannot be seen. The drive has to carry a creek but that is easy enough. Behind the green, which is fairly shallow and angled front right to back left, there is a creek that is just about 5 yards beyond the right half the green. Thus, approaches coming in from the left side to right pin placements are actually quite dangerous. 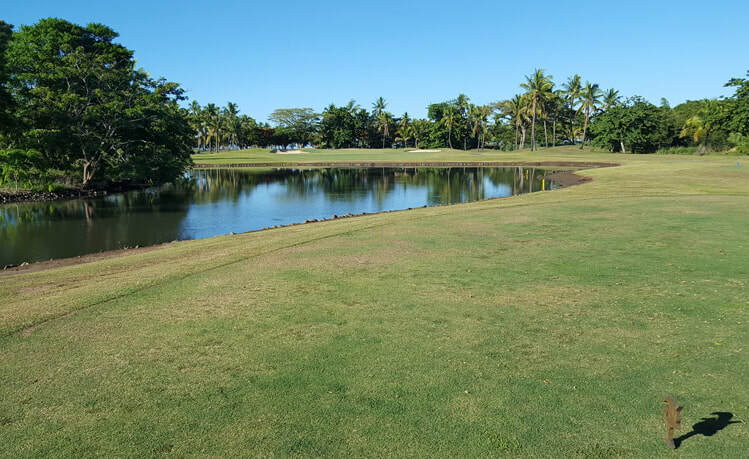 Denarau Golf Club Hole 11: Another par three over water that isn't in play for a decent shot, this hole plays pretty long and requires a decent mid iron or longer between the bunkers to the fairly large green. 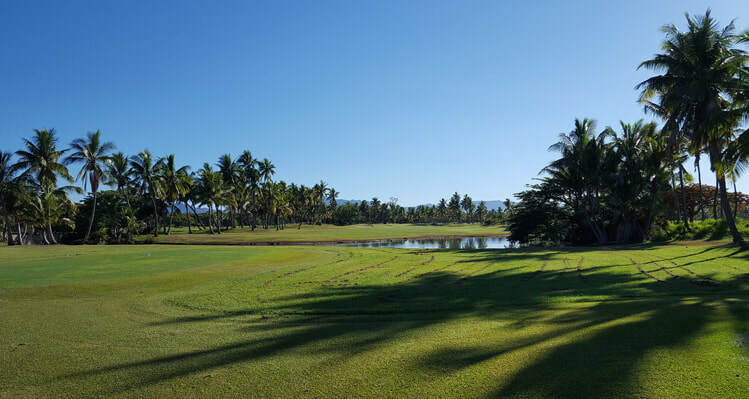 Denarau Golf Club Hole 12: The water on the right can be avoided by taking driver and the main objective is to avoid the fairway bunker. The green is fairly undulating and has a "must avoid" bunker on the left side. Denarau Golf Club Hole 14: This par five doglegs right twice along the creek, which is in play on the first two shots if the player tries to cut the corner. There is plenty of room left however and the green is very accessible. 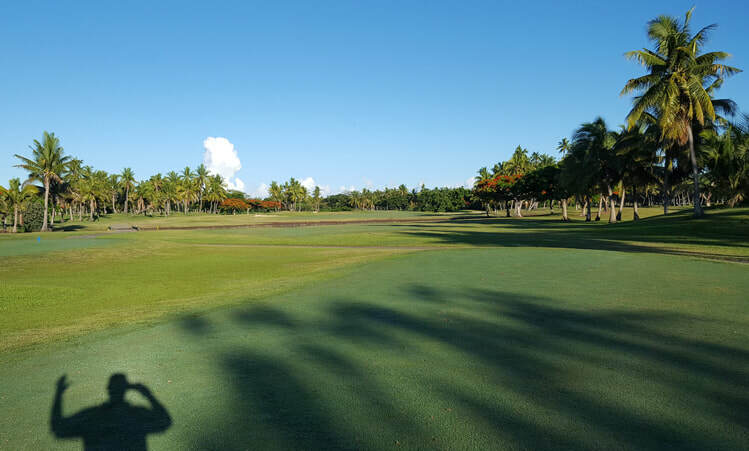 Denarau Golf Club Hole 15: This par four is straight and flat, with a tee in the middle of the fairway that can be pretty easily flown. From the green, the player gets the only view of the ocean on the whole course, which is quite amazing since the entire track is nestled no more than 1km from it at all times. Denarau Golf Club Hole 17: The final par three once again features water but this time it is more of a real problem for most pin placement. The green is quite large, however, so a decent shot will stay dry. Denarau Golf Club Hole 18: Each nine ends with a par five that crosses a stream after the drive, but both are in play for massive drives. The finishing hole also has water to the right off the tee and another stream that crosses right in front of the green, making this one quite a bit tougher way to finish.